ICON Issues Desperate Plea For Help: Find Us FJ40 Hoods! Everyone knows about ICON, right? On the off chance you’re reading this and somehow aren’t aware about the glory of ICON, they’re a small company that manages to make some of the most amazing SUVs in the world, as well as resurrecting old basket case cars and turning them into astounding retro-modern loud, rolling art. They’re great, and now they need our help. One of ICON’s oldest and most, um, iconic, products are their extensively remanufactured and rebuilt Toyota FJ40s. They’ve been building them for years, and have relied on certain Toyota parts in the process. That’s where their problem comes in: Toyota is no longer producing hoods for FJ40s, and they need them. Bad. 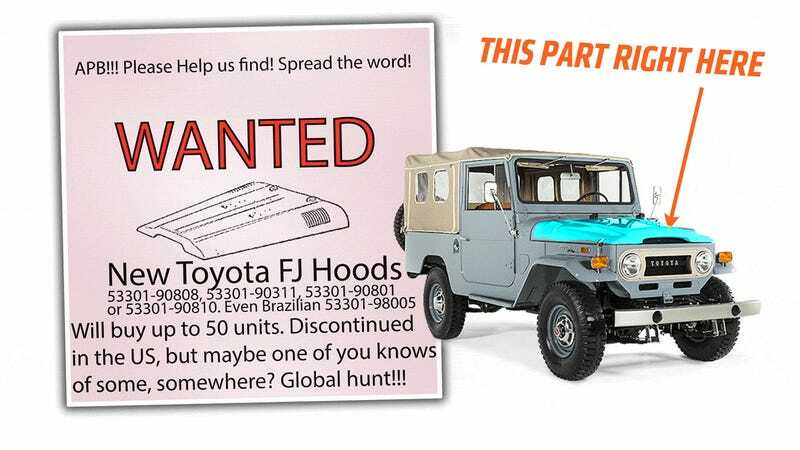 ICON founder Jonathan Ward has put out a global call for new Toyota FJ hoods, wherever secret caches of them may exist. He’ll even take the Brazilian variants. So, anyone have any leads? If so, contact Jonathan, maybe via his Facebook page here, and I suspect he’ll be very grateful. I really can’t think of any better group of people to ask than the greater Jalopnik Republic, so hopefully a nice secret stash of hoods will turn up in the corner of some Albanian slaughterhouse, or something. Ever Wonder What It Takes To Build An Icon?